So, tell me a bit about your experience. These phrases are all essentially alternate ways of asking you about your experience, which eventually comes up in every interview. However, interviewers aren’t looking for your life story. They want to know specifics on how your individual experience makes you the ideal candidate for the job. Here’s how to give them the information they are looking for. If the experience question is open-ended (Tell me about yourself, Can you speak on your experience?, etc. ), keep your answer specific. Keep a running list of your top three achievements/most impactful job experiences and keep you answer to those top three. You don’t need to cover your entire job history in one question. Try not to go beyond a minute in your response. When you practice, time yourself to make sure you don’t end up going over that time limit. Allot specific chunks of time for each work experience so you don’t end up talking too much about one experience over another. Everyone’s work experience is different. To stand out, be specific about how yours is unique. If you’ve been in the workforce for quite some time, leverage that. Explain that you know the ins and outs of the industry and are always happy to share your experience. Talk about a specific experience that changed your outlook and improved your productivity/success. If you don’t have a lot of experience, that’s okay, too. Focus on what you have accomplished, and your willingness to learn specific methodologies or responsibilities in your industry. 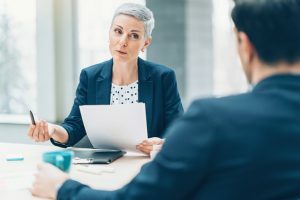 For example, when interviewing for an administrative position: you could say that although you don’t have much work experience, you’re confident you can manage the core responsibilities of the position and would like the chance to continually learn new things and complete more training programs. If you can, use metrics for your accomplishments (reduced customer call time by 50%, reduced time spent on the product line by 30%, etc.). Just don’t forget to lead into those statistics with personal stories. All of your experience should portray you in a positive light. Whether you’re talking about how you filled a space vacated by a team member and led the group to success, or how you created an innovative strategy to speed up product development, always keep things upbeat. It’s fine to mention that you overcame a tough situation to reach a goal, but don’t dwell on the negative aspects of that situation. Your interviewer doesn’t need to know about how lazy your manager was or how unorganized a team was before you came on board. Tell us about your unique work experience in the comments section below! Next Post The Movin’ On Up Blog is Getting a New Name!